Known primarily as the male half of experimental pop-electronica-jazz duo Rimacona labs, Marihiko Hara departs from structured pop-song writing and dives ears-first into ambient soundscapes. There's a feeling of tonal space throughout the album - a layering of soft lows and harsh highs that, more often than not, fit the collection well. Whilst there are elements of beauty here, it's not all happiness and light in the gardens of Hara; there's loneliness and even menace under the surface, particularly on 'composition', the album's equivalent to watching Ring alone with the lights off. The jazz influences of Rimacona break through on occasion - 'sleep' uses jagged, choppy piano underneath white noise, clicks and bleeps to intrigue, but ultimately confuse. Not the best track, but interesting, and hints at promising things to come. Standout tracks include the opening track 'ripple', with slow, casual synth swells that hover throughout, incised with the occasional high frequency sweep. Pleasure and pain in equal quantities. Startling, especially from an 'ambient' release. 'Glasperlenspiel' is a difficult but worthwhile listen, with confused and broken glitches creeping in and inexorably overrunning the warm, tonal beginning - the musical equivalent of walking barefoot on a deep pile carpet only to find pieces of broken glass underfoot. Finally, the closing track, 'modena', with thoroughly mangled guest vocals from Natsuko Yanagimoto feels open and relaxed, retaining just enough structure and movement to stay interesting for the duration. It remains to be seen what's to come from Hara - he certainly seems comfortable in this setting, however the album doesn't quite hang together in the end. It's not the fault of the individual tracks; perhaps it isn't designed to be listened to in one sitting. Nouvelle ode à la le rêverie, au délassement, nouvelle balade musicale ambient avec Marihiko Hara qui nous gratifie d’un très bel exercice de collages sonores avec ce nouvel album sur Zymogen, l’occasion de découvrir ce japonais vraiment intéressant, sur 12 compositions où les nappes et les micro-mélodies se superposent avec bonheur dans un habile travail d’assemblage de drones, de notes de piano, de field recordings, qui donne des paysages sonores travaillés, très beaux. Un travail qui fait que l’intérêt que l’on porte à cet album va croissant au fil des titres… ce qui n’est pas toujours le cas dans ce genre de musique. Et bien que l’album dure 48 minutes malgré son aspect dépouillé et expérimental, à aucun moment l’ensemble ne souffre de la longueur, bien au contraire, cette dernière joue sur l’imprégnation, sur le rapprochement qui se fait petit à petit entre l’auditeur et cette musique. Remarquable. With Marihiko Hara’s "Cesura", the inerrable Zymogen Netlabel dropped another outstanding Ambient-album. While Takeshi Nakamura, the other Japanese Artist on Zymogen, is commonly known for his razor sharp Digitronica, Marihiko Hara provides his diversified Ambient-textures with rather velvet gloves. Smooth electro-acoustic music with Pop-appeal and relevance? There you go! Alongside Natsuko Yanagimoto, Marihiko is 50% of Experimental Pop-duo Rimacona. Their mixture of Jazz, Electronica and J-Pop is refreshing yet clearly based on Asian and European standards. Without his songstress, Marihiko creates spectacular music that does not know about borders. His texture are rich in sound and harmony, his glitches haven’t been heard before, noise and melody are in perfect balance. It’s difficult to pick certain songs because every one of them deserves attention...maybe you can start with the minimalistic bubbling "Traumfolge", the epic title track “Cesura”, the piano-ballad "Konstellation" or "Modena" featuring Natsuko Yanagimoto on the mic. All-time classic, I’m serious. To review this release I could talk about the beautiful melodies here, about the amazing sound palette used on this record; I could also talk about the incredible textural and spacial work done here or about the minimal and delicate use of rhythm featured here. I could say that Cesura is the beautiful score for a movie composed by twelve scenes, twelve stories, twelve protagonists, twelve settings, twelve DP's, twelve directors but just one writer. But I won't. I have been trying to start this article for 5 or more times without major success. This release seems to be more lyrical, descriptive and literal than most of the works I have recently reviewed. Since I delayed reviewing Cesura so much, I am now forced and delighted to do it on the road, away from home, away from all the elements that repeatedly kept me from finishing my job. Cesura brings the surprise, the joy and the hope that has been lost since we grew up. Cesura is childish but nevertheless not a candid or naive work. Cesura is sweet, sad, uplifting, contemplative, fragile, beautiful, like a leaf falling from a tree in slow motion. Like a lonely quiet moment beholding the sunset after a night of wild partying. Like a night drive at 1 AM on our way home. Cesura could also be eerie, stubborn and arrogant...like many people we know and love. Cesura is human, very human: imperfect and strongly beautiful. Cesura is the center of a hurricane, where you feel calmness and peace, but where the boundaries warn you of violence and chaos. I honestly believe that any further writing will be pointless and redundant, if these words won't inspire you to listen then try the featured sample, which very likely will. All I can say is that it feels better after you hear it, way better. Marihiko Hara is from Japan and Zymogen is based in Modena, Italy and is runned by Filippo Aldovini. 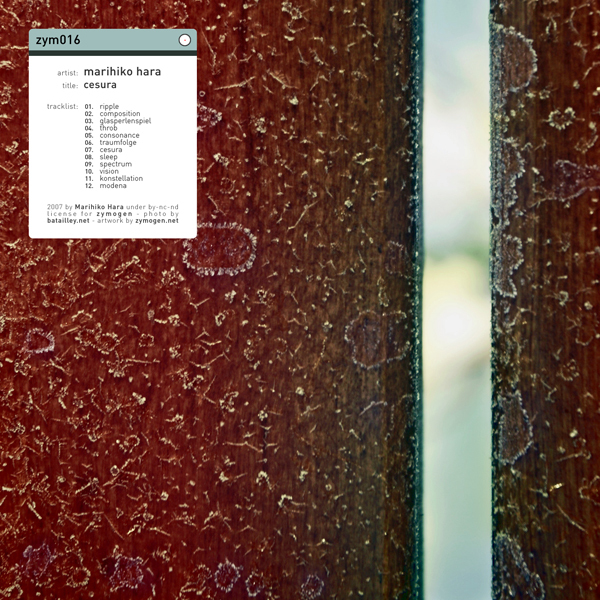 Marihiko Hara underscores the position of Zymogen as the sunset of minimalistic and experimental ambient. This cesura has some multiple personalities spanning from the peaceful blessed to the narcotic psycho stumbling upon obstacles in between. Gaps and noises are handshaking between fluffy sunbeams while some blue notes are played by the drone space orchestra. Exciting beautiful ambiences! Seguimos con la experimental, pero esta vez dejando a un lado el oscurismo habitual para recomendaros, como no, lo último de zymogen. El japonés Marihiko Hara es el encargado de firmar la referencia que celebra los dos años de este netlabel con este collage de sonidos que es "cesura". Doce temas con grandes momentos como "throb", un disco en el que te vas sumergiendo poco a poco. If you’re into pretty weird drone ambient, you might want to check the latest release by netlabel Zymogen, the album Cesura by Marihiko Hara. Pretty weird stuff, well produced and with interesting idea. The glooming tracks might sound like a chaotic blend of noises, short piano melodies, and field recordings at first, but once you get into it there’s a lot musicality to discover. Nice one! Dass die Italiener mit Zymogen in der Oberliga der Netaudioszene mitspielen, dürfte regelmäßigen Kreislauf-Lesern schon bekannt sein. Jetzt feiert das ambitionierte Label seinen zweiten Geburtstag und trumpft auch gleich mit einer neuen Veröffentlichung auf. So und nun: Marihiko Hara kommt irgendwo aus Japan und ist Mitglied vom Kollektiv Rimacona. Mit seinem Kinnbart sieht er nicht nur süß aus, er macht auch experimentellen Pop jenseits der Kulturen und natürlich Kommerz. Unsere westlichen Ohren müssen sich nicht erst groß umgewöhnen, um diese Soundskulpturen verstehen zu können, sind sie doch Eno-geschult. Zeitloser Ambient, der uns auf eine große Reise mitnimmt! Was will man eigentlich noch mehr? Vielleicht noch einen Liegestuhl mit Massagefunktion - das wärs!